This completely revised second edition of Scottish Hill & Mountain Names builds on the huge success of its predecessor. Many new names are included and many of the chapters have been re-structured the match the areas in the SMC hillwalkers' district guides. 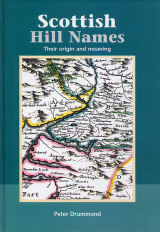 A substantial chapter entitled Hill Name Generics has been added which is in effect a dictionary of nearly 120 Gaelic, Scots, Cumbric and Norse words for hills and summits - anyone with a genuine interest in Scotland's mountains should have a copy on their bookshelf.